If you are a water sports lover, you must have tried out different water sports till now and want to experience more thrill in the world of water sports. Even thought of combining a motorbike, jet ski, and an aircraft? I know that you may think, how it can be possible. But yes, it is possible in this world of technology. You just need to buy a Jetovator. Now, what’s that vehicle? It has a sleek body of a racing motorbike, aerial capabilities of a fighter aircraft and the stealthy elements of a jet ski, awesome, isn’t it? And the best thing about it is that it is very simple and easy to use. You won’t require any kind of training for riding this cool water vehicle and it is quite safe also. To ride it, there should be two persons: One for controlling the height and direction of the Jetovator and another for controlling the throttle. Jetovator – How does it work? It extends the ability of an existing personal watercraft (PWC). The Jetovator does not come with its own power source and requires a minimum of 130 hp personal watercraft to operate. 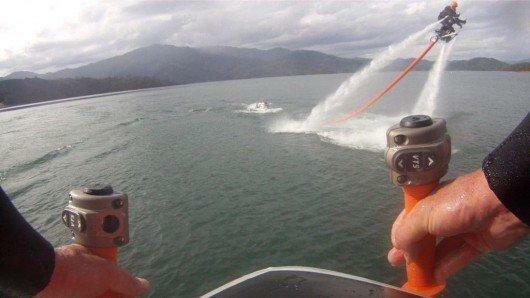 The Jetovator redirects the water thrust from the jet unit of the PWC along a forty foot hose to the Jetovator body. This water thrust is then used to propel and elevate the Jetovator into the air. The rider can also redirect the water thrust of the two front nozzles in order to control the Jetovator in different directions. 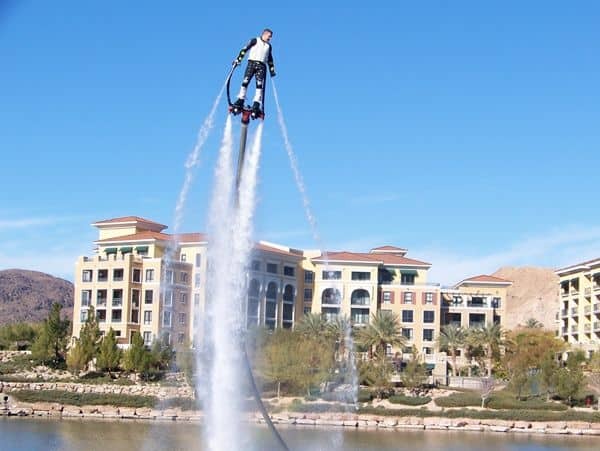 The Jetovator can attain forward speeds of 25mph and riders can cruise in comfort for long distances and Jetovator is limited to a height of 25 feet and can also dive underwater for a brief duration. Freestyle tricks can also be performed with this cool water sports vehicle, but it may require professional training as it is a little tricky. Now as we have spoken about this awesome water automobile, let’s take a sneak peek into its capabilities and specifications.